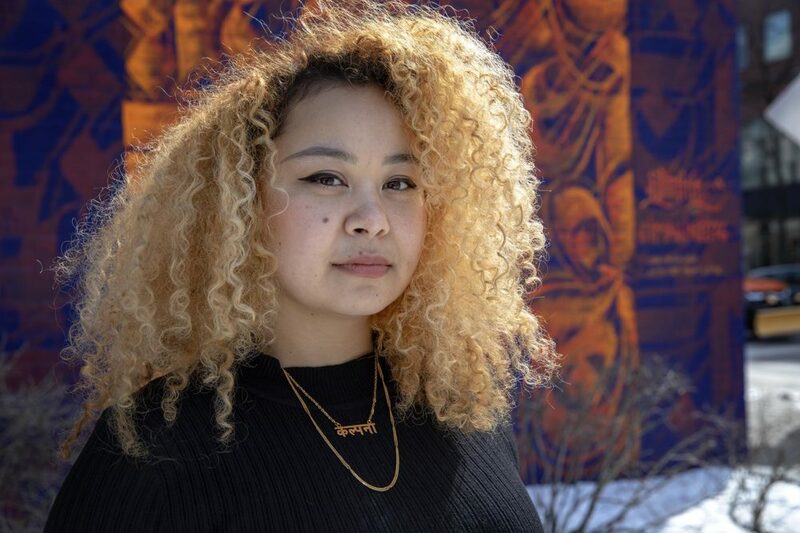 Sneha Shrestha remembers waking up at sunrise on Saturdays to lug a duffel bag brimming with brushes and spray cans to the legal graffiti wall in Cambridge's Central Square. “This spot right here was my spot — well I made it my spot,” she clarified, pointing to the edges that delineated her former swath of brick. That was back in 2011. Seasoned writers, mostly guys, trickled in to stake their claim. It’s a popular spot, so busy on weekends that if you leave for lunch your fresh art can get painted over before it’s even dry. 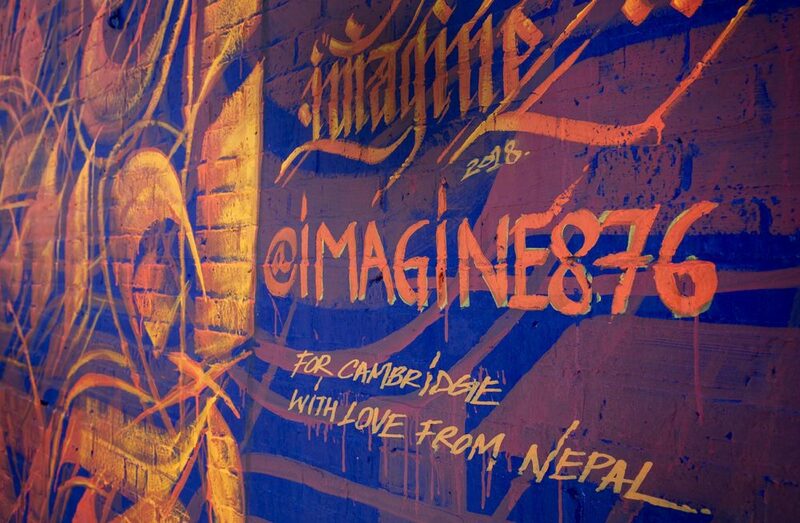 It’s where the Kathmandu native’s journey as an international street artist began. 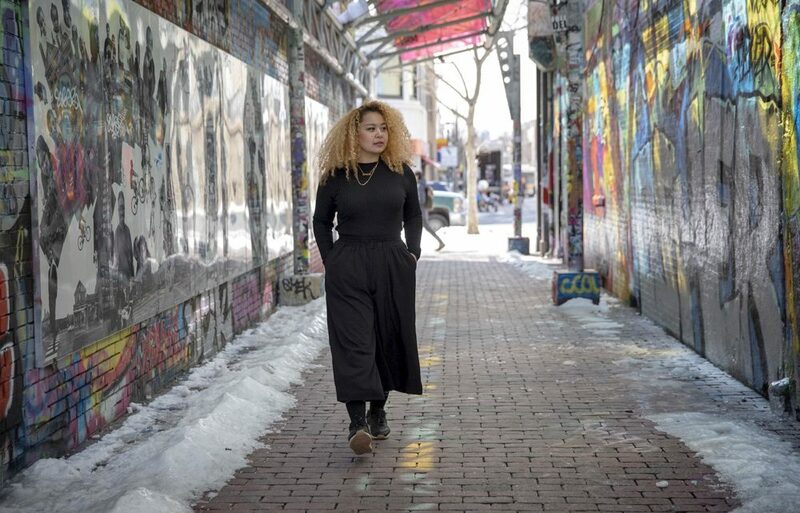 She's among a new generation of graffiti writers in Boston bringing diverse perspectives to our cityscape. But that’s what she's been doing since graduating from Gettysburg College where she studied art. Soon after moving to Boston, Shrestha started working at Artists for Humanity, a nonprofit that helps teens tap into their creativity. Co-founder Rob “ProBlak” Gibbs became her mentor. She practiced outlines, filling, embellishment — but she struggled to find her own voice. Then, Shrestha started experimenting in her native tongue. Shrestha got to work — finessing the curvaceous Sanskrit calligraphy. She experimented with vibrant reds, blues, gold she'd see in Nepal. And she adopted a street name: “Imagine,” which is her mother’s translated into English. Now you see her bold, curvaceous signature at schools, at corporate offices including Facebook's Boston office, on beer cans, in museum galleries and on walls around the world – from Istanbul to Copenhagen to Kathmandu. But a stunning concentration can be found here in Massachusetts. You can check them out in Worcester, Lynn, Cambridge and Dorchester. Gibbs says putting Nepali letters, words and phrases in our neighborhoods stokes curiosity and conversation. "What it's doing is inviting somebody to look into and say, 'Hey, I love what you're doing, but what is that?' " he said. "It’s like if poetry came alive — and you froze it — and put it on a wall." Shrestha is also pushing graffiti and street art’s legitimacy forward, Gibbs said. 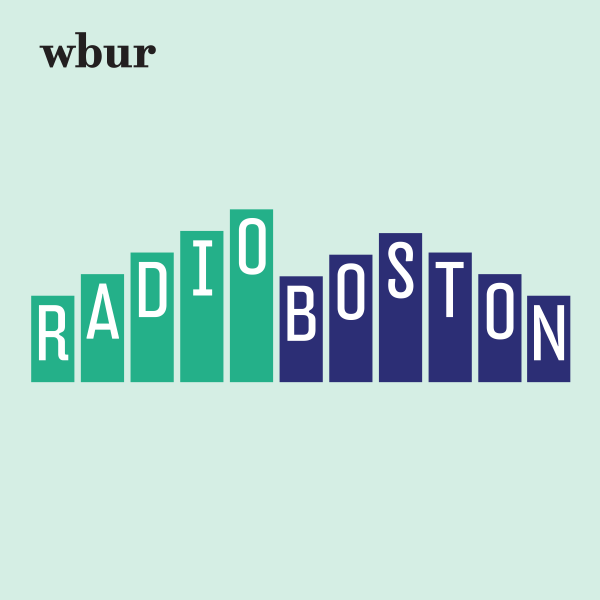 In 2018 she was a city of Boston's artist-in-residence, but he points to the fact that not too long ago paint on walls was widely viewed as vandalism. There's that infamous incident in 2009 involving Shepard Fairey, the artist behind President Obama's iconic "Hope" image. Fairey came to town for his big solo exhibition at the Institute for Contemporary Art. On the way to his opening, Fairey was arrested on two outstanding warrants for property defacement. Boston has come a long way since then, Gibbs, said, and Shrestha is bringing her global aesthetic to Boston. It seems Shrestha never stops looking for ways to explore, share and spark imagination. Teaching is a big part of that mission, too. “Being at Artists for Humanity and visiting museums around Boston made me realize the impact that art can have for young people,” she told me. 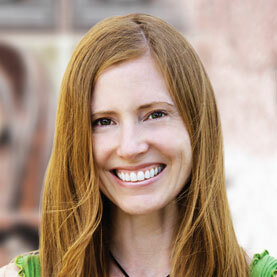 She earned a Master’s degree in education at Harvard, and opened Nepal’s first Children’s Art Museum. The week we met up, Shrestha was bouncing between her residency with Museum of Fine Art’s education department, her job managing visiting artists at Harvard’s Southeast Asia Institute, a mentoring project at MassArt, installing her new exhibition, "Golden Equinox," at Simmons University, and giving a talk about innovative creativity for designers at Reebok. As we made our way over to her largest wall at the corner of Mass. 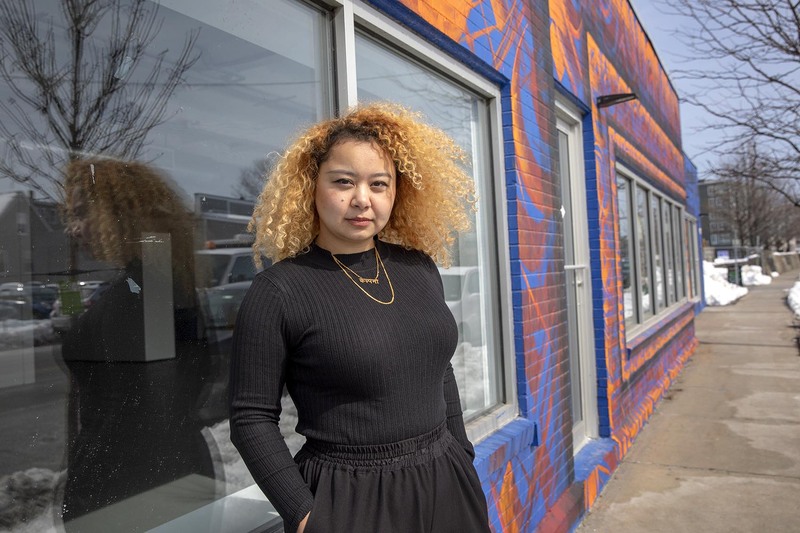 Ave. and Main Street in Cambridge, Shrestha's passion for her many projects was palpable, but her overall vibe was serene. Luminescent yellow and orange Sanskrit letters loomed in the distance. 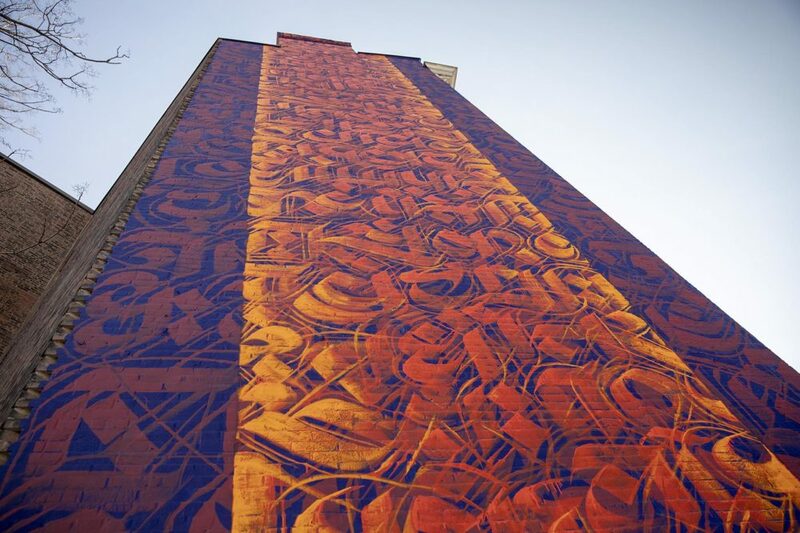 Shrestha painted them on the flank of a five-story building just a few blocks from the free graffiti alley where she first put brush to brick. Shrestha explained how all of her murals are site-specific. For this one, she layered wise words from a famous Nepali poet that pop off her vibrant, violet-blue base coat. For Shrestha, the huge, Nepali letters represent her tiny country on the other side of the world. She also hopes people who experience them here will be inspired to imagine what’s possible for themselves.